With other great new features, PostgreSQL 9.2 makes DBAs life easy by providing more metrics in statistics collector views. Out of those , pg_stat_database caught my eyes because it provides a lot more details compare to Postgres 9.1 and other previous versions. As you have noticed above, pg_stat_database has number of new columsn in Postgres 9.2 compare to previous versions. I’m here to discuss temp_files and temp_bytes columns. temp_files : Number of temporary files created by queries in this database. All temporary files are counted, regardless of why the temporary file was created (e.g., sorting or hashing), and regardless of the log_temp_files setting. temp_bytes: Total amount of data written to temporary files by queries in this database. All temporary files are counted, regardless of why the temporary file was created, and regardless of the log_temp_files setting. As you are aware that temp_files generation could cause performance issues . Historically, it was possible to track temp files generation by enabling log_temp_files setting in postgresql.conf and analyze logs using pg_badger. 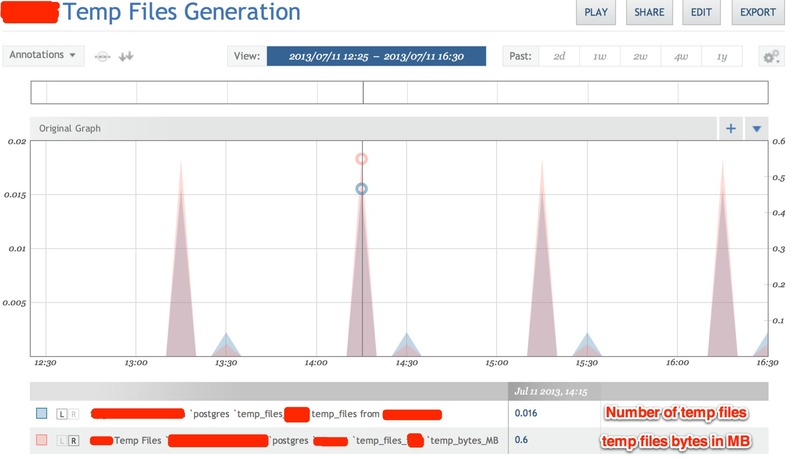 Now, Postgres 9.2 allows you to monitor temp files generation in real time! It is trivial to add above query to start monitoring, trending and alerting using Circonus (See below graph) .